Who is dreaming of a vacation to a beach? (insert raised hand emoji here) Yep, this is my dream EVERY. SINGLE. DAY. I live in the Midwest so beaches are hard to come by around here. 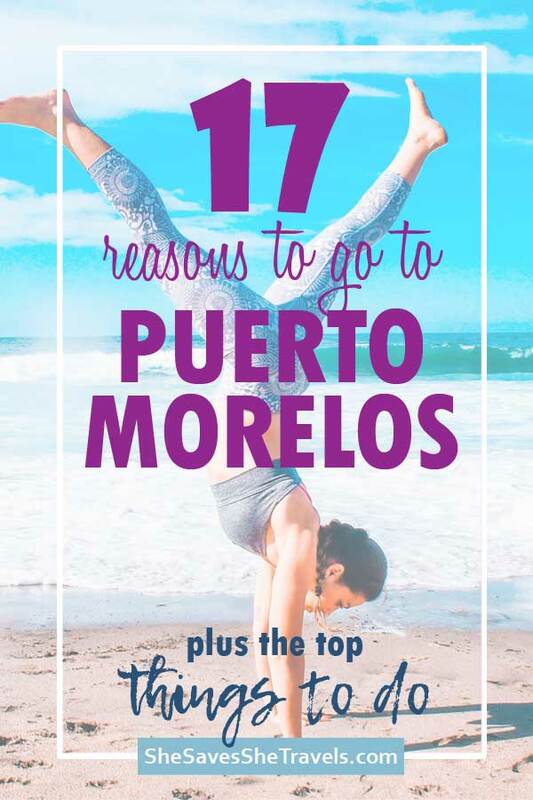 I hadn’t even heard of Puerto Morelos until I started looking at new places to visit south of the border, that are affordable and easy to get to. There’s plenty of things to do in Puerto Morelos, and friends, it’s just so beautiful. 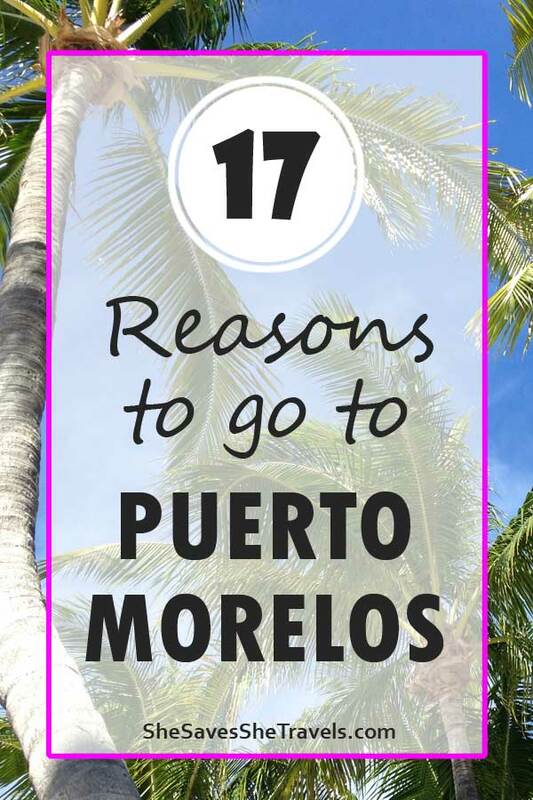 Read on to discover my 17 reasons to go to Puerto Morelos. 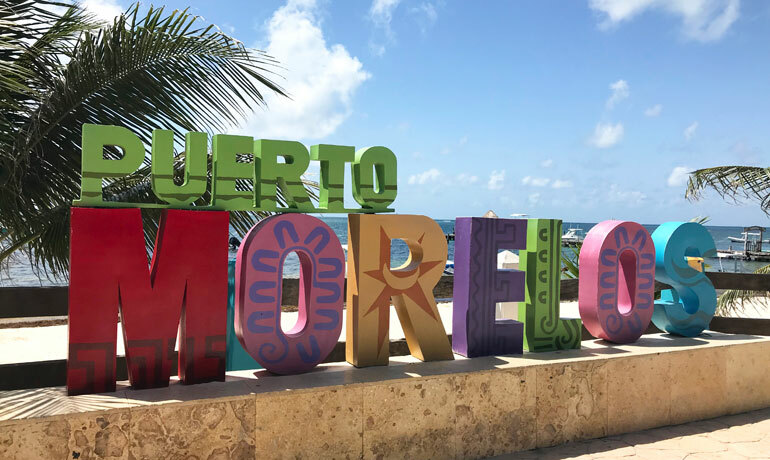 Ok so you might be asking ‘where is Puerto Morelos?’ It’s nestled about half way between Cancun and Playa Del Carmen on Mexico’s Yucatán Peninsula. The Huffington Post called Puerto Morales “Cancun’s quiet little neighbor” and for good reason! My family’s visit to this sleepy little fishing village was a refreshing break from the typical spring-breaker experience that comes to mind when you think of a Mexican beach vacation. Puerto Morelos is definitely dream-worthy. It’s quaint, with only about 9,000 people living there. Plus there’s no stop lights, no big chain restaurants or night clubs full of 20-something tourists. It’s what I envisioned a small town in Mexico would be and honestly a great spot for a getaway. 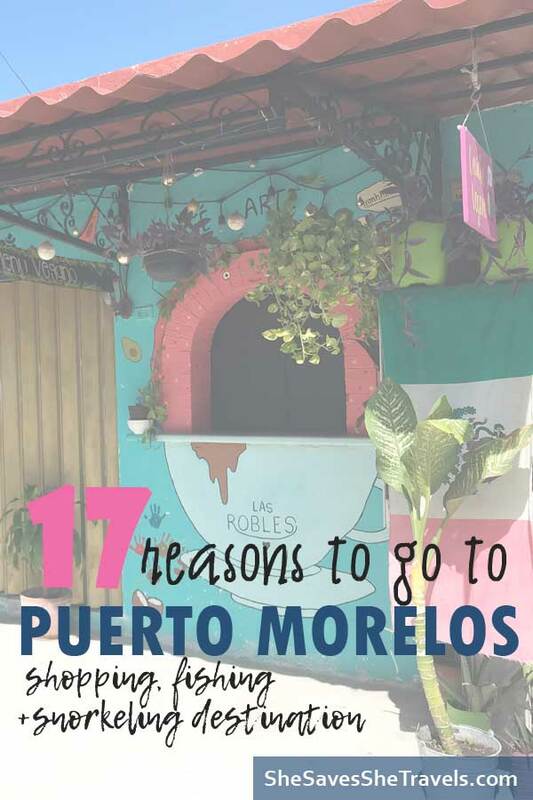 Based on my week-long trip to this lovely little village, I’ve compiled my top 17 reasons to go to Puerto Morelos. A great spot for a stingray or sea turtle sighting, snorkeling the coral reef is the best-of-the-best for snorkeling experiences. Snorkeling-Report.com rates this reef #7 in the world! It truly is a must-see! Local tip: keep in mind that coral reefs are a vital part of the ecosystem, so it’s strongly recommend not to touch them. This includes stepping on them in shallow areas. There are also new studies out that certain sunscreen ingredients are damaging our oceans, so it’s recommended to use reef-safe sunscreen. 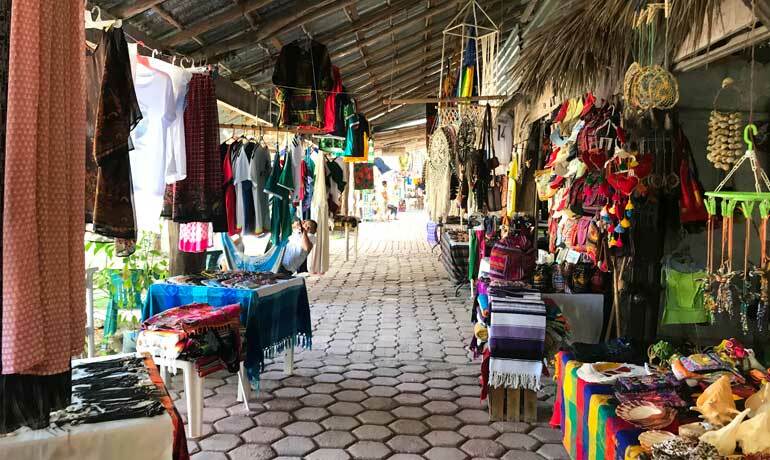 Close to the Mayan ruins of Tulum, Xel-ha and Chichen Itza, Puerto Morelos is near quite a few destinations that are great to experience culture and history. A tip if you go to the ancient ruins: get there early, before the majority of the tourists do so you can get the full experience without the crowds. The Caribbean waters are my favorite (so far) for swimming and enjoying being in the water. It’s a place to really get out into the ocean and soak it in for all its wonders. Although there was quite a bit of seaweed at the beaches in Puerto Morales, the water was very warm and relatively calm because of the reef. Just off the town square in Puerto Morelos, is the coral reef that comes within about 400 yards of the shore. This reef, also known as the Mesoamerican Reef, is the 3rd largest in the world. At this point it’s the closest coral reef to a beach in the world, and actually works to protect the town from hurricanes. It functions as a shield for big waves during tropical storms, thus reducing flooding. Our little kids were able to enjoy the waves from the ocean without large white caps knocking them over. One of the best reasons to go to Puerto Morelos if you have little ones! 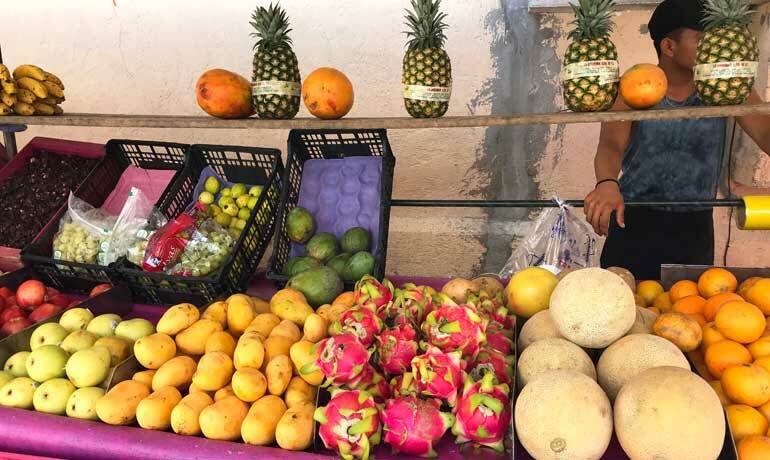 At the many shopping markets, you’re getting authentic Mexican goods for a fraction of the price in the larger, more well-recognized places. From clothing and jewelry to housewares and toys, you’re sure to bring some authentic goods back home. I bought a hammock swing for a steal! It was half the price as I could have gotten it in the U.S., not to mention the materials are great quality. I’m looking forward to using it (and remembering Puerto Morelos every time I sit in it) for years to come. One of my favorite reasons to go to Puerto Morelos! I love a good town square, and let me tell you the square in Puerto Morelos is beautiful! It reminds me of the town near where I grew up and it’s where the action happens. And when I say ‘action’ in Puerto Morelos, I mean a farmer’s market, restaurants and tourist shops. It’s such a great place to hang out and enjoy the beauty of Puerto Morelos. Everyone we came in contact with was so genuinely kind and helpful. The merchants in the market and stores weren’t pushy (an experience you’ll often encounter in international markets like these). It felt like they really just wanted us to have a good time. At the same time I felt respected and appreciated throughout the trip. While we were visiting Puerto Morelos, we asked a local why there was so much seaweed washing up on the shore. He said scientists don’t have a definitive answer, but have three reasons why it could be so thick. 1. The pollution and waste in the ocean. Sea weed is a natural cleanser and by over-producing, it could be a reaction to unclean water. 2. Global warming. Sea weed is a plant that blooms and produces more based on water temperature. 3. The imbalance in species. Meaning there aren’t enough natural wildlife to eat the seaweed and tame it down, so it’s overly abundant right now. We stumbled upon a local farmer’s market where you could buy jams and jellies, soaps, fruits and veggies, and it was absolutely delightful. As a matter of fact, I can honestly say I wasn’t sure what some of the fruits and veggies were! And fellow dreamers, that’s exactly why I love to travel (well, one of the reasons). I got to see and experience the local food and climate, a much different scene from the cornfields of Nebraska. Relaxation, rejuvenation and healing are synonymous with both yoga and the beach. Combining the two is perfection! So grab your yoga pants, or even just your swimming suit and head down to the beach for a peaceful yoga session. Hallelujah! I looove to travel, but am not a fan of places so busy you can’t even enjoy what you’re there to experience because it’s packed with people. 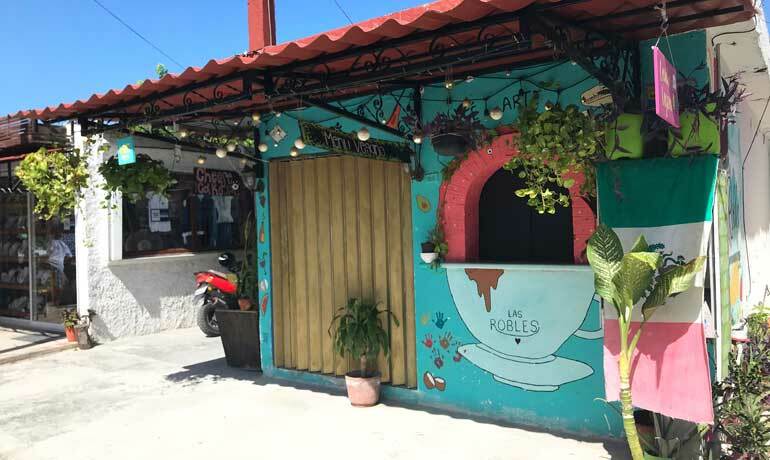 In Puerto Morelos, you’ll see the occasional bike tour from a local resort, but they’re in groups of less than 20 people and pretty low-key. 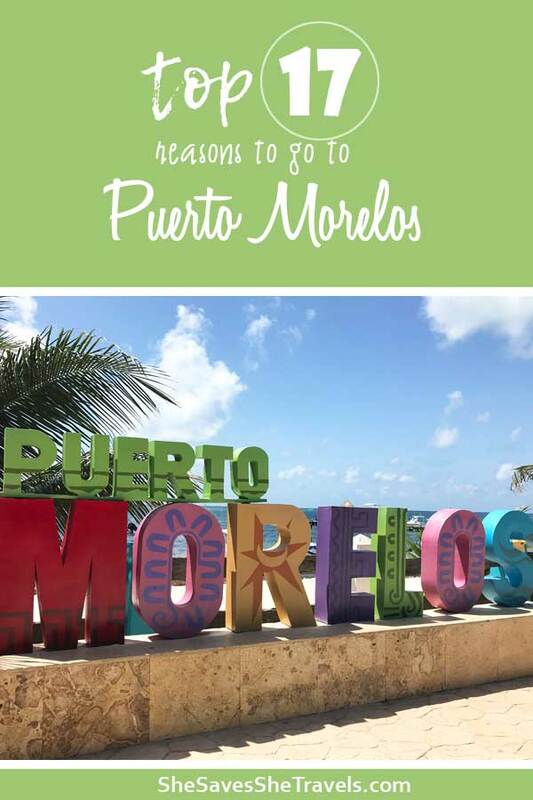 In Puerto Morelos, you’ll generally avoid the crowds that Cancun, Cozumel or Playa Del Carmen attract. So when I talk about reasons to go to Puerto Morelos, this, in my opinion, is a huge one! Whether you’re looking to book a family vacation with the kids, a romantic getaway for two or an adult vacation with friends, there’s plenty of all-inclusive resorts to choose from in Puerto Morelos. From the ocean views to the food, to the pools and entertainment, you’re sure to find someplace that’s just right for your travels. The merchants work hard to sell their hand-crafted items to tourists, $3, $8 or $15 items at a time. They’re friendly and I didn’t experience them to be too pushy, either. If anything, they’ve got a sense of humor. Equally important, the children in my family gained a new perspective, beyond what they’ve known as working hard. And to today’s youth, this can be powerful. This was an unexpected favorite on my list of reasons to go to Puerto Morelos. I mean, can these colors get any more vibrant and inspirational? Bright, vivid colors covered the walls of restaurants, shops and houses. Not to mention the town appeared to be happy and relaxing in every way. Friends, I love when I can fly into a city and be only a 20 minute drive from the airport. Who wants to spend hours driving after you’ve already spent hours flying? Enough said. In a world where the news is constantly showing crime, violence and destruction literally everywhere, this was a factor of traveling internationally for us. I never once felt concerned for our family’s safety or our belongings. We literally went right by a police station, and there were no less than a dozen policemen standing right out front. It really made our group feel very safe. And this, my friend, is one of the best reasons to go to Puerto Morelos! 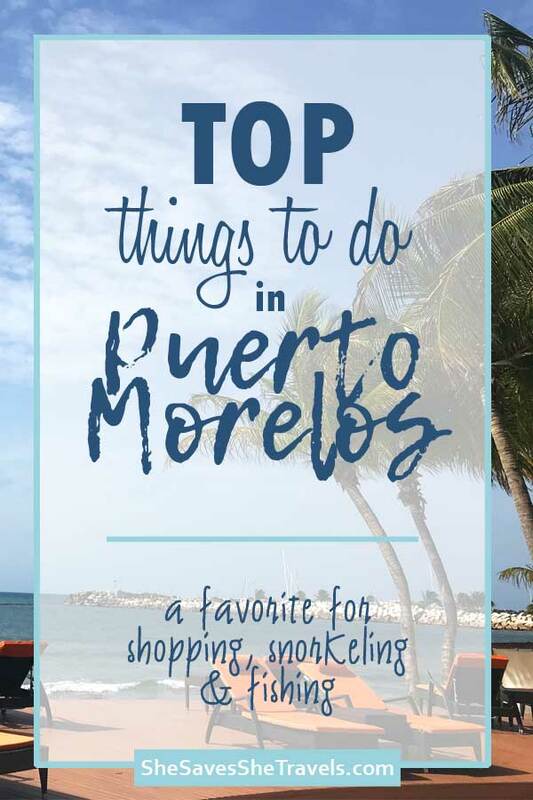 So whether you’re looking for adventurous trip with plenty of things to do in in the Caribbean, or a chill vacation lounging by the ocean, Puerto Morelos might just be the destination for you. 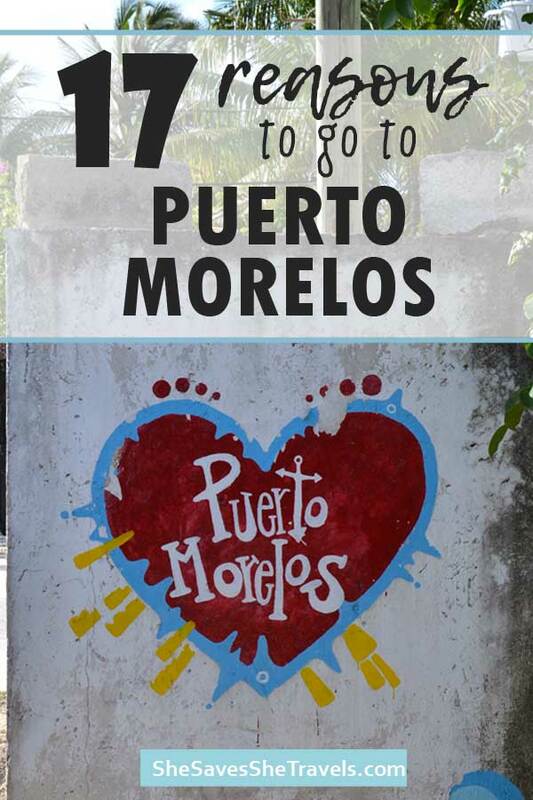 I hope you’ve enjoyed these 17 reasons to go to Puerto Morelos. So tell me, what’s the one thing that you would find the most interesting or exciting during a trip to Puerto Morelos? I’d love to know in the comment section below!